At Sheila’s in Crowfoot you can speak to the owners Sheila or Loren in regard to your Motorization needs for your home. Our Store features many Hunter Douglas Motorized Blinds, hard-wired systems, as well as battery operated blinds. 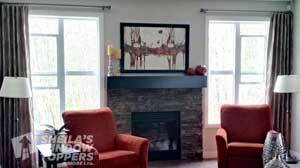 Stop by Our Calgary window coverings showroom to learn more about Hunter Douglas Power Blinds. We are one of Calgary’s few Hunter Douglas Certified Motorization Specialist Stores. 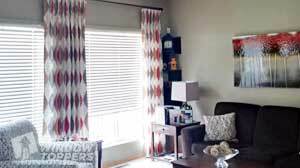 Many Hunter Douglas window fashions can be motorized. That means a motor in the headrail does the work of raising, lowering or tilting the window covering. The methods of motorization are as varied as the products themselves. Some systems are powered by batteries, others by household current or power supplies. Additionally, many Hunter Douglas motorized products can be controlled as part of a lighting or whole-home automation system. Operate Your Blinds From Your Phone! 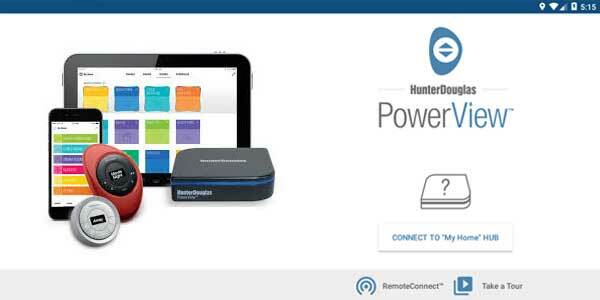 Operate your Hunter Douglas Power shades through the Hunter Douglas App on your phone or iPad through their Remote Connect. You can connect from outside the house and operate your blinds from anywhere in the world. 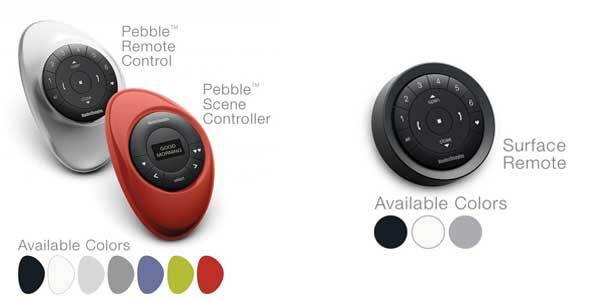 Designed for child safety and pet safety because no cords are needed to operate blinds. Motorized window coverings can be operated with a remote control, a touch panel or even light sensors. In addition, operation can be programmed to raise and lower the window coverings at certain times of the day, on different days of the week. Home automation systems can easily accommodate motor-only window coverings and Hard-Wired systems from Hunter Douglas. 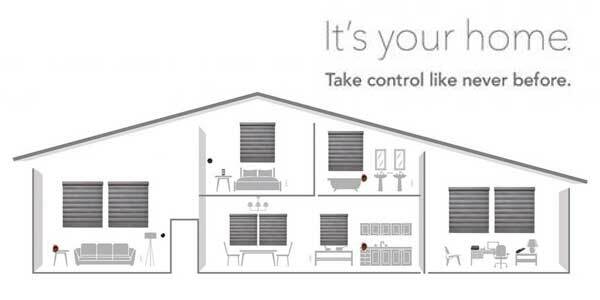 Hunter Douglas products are very versatile in adapting to the variety of home automation control sources. The Hunter Douglas PowerView App allows you to control your window coverings on your smartphone or ipad, you can create and schedule customized room Scenes that allow your shades to operate on their own throughout the day. 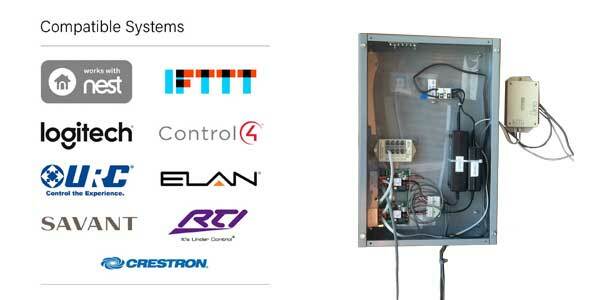 The hard-wired systems will work alone or with your Home-Automation System including Z-Wave. We will work with your Home Automation Company to ensure you can have beautiful Hunter Douglas window coverings fully automated! We are one of Calgary’s few Hunter Douglas Certified Motorization Specialist Stores. An ESI panel which operates the four Hard Wired blinds in our Crowfoot Showroom. This system can be integrated into any home automation system to operate your blinds or can operate independently with a remote control. Call and speak to the owners Sheila or Loren or drop by our Crowfoot Store to see our Motorized Displays! We only have ONE location, which is in Crowfoot and Sheila & Loren have been Certified as a Hunter Douglas Motorization Specialists. The best time to wire a house for home automation is while the house is being constructed. This minimizes the cost and effort. If you are considering a Hard-wired system to operate your Hunter Douglas blinds for you new home, you will need to start the process long before the wiring stage. Plans need to be designed for the Hard-wired system that will be used. Once the system has been designed, meetings will are held with the electrician to go over wiring diagrams. At Sheila’s Window Toppers, the quote you will receive for your hard wired window coverings will include wiring diagrams for your electrician. If you think that you may want HARD WIRED blinds in the future have the Electrician run 14-3 wire to the top right corner of the windows. If you have any high or hard to reach windows, run these wires during the building stage as you may want to add the blinds at a later date. Convenience– Simply press a button on the remote or wireless wall switch to operate individual shades or groups of shades. Accessibility – Motorized window coverings are perfect for hard -to-reach window locations where manual operation is difficult. Appearance – With few or no operating cords, more attention is placed on the natural beauty and appearance of the window covering. Enhanced Child and Pet Safety- Motorized window coverings reduce the potential safety risks associated with manual operating systems. Home Automation – Systems can be integrated into any home automation system for even greater convenience. 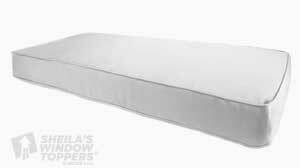 At Sheila’s Window Toppers in Crowfoot we specialize in working with our customers to design quality custom made Ottomans. 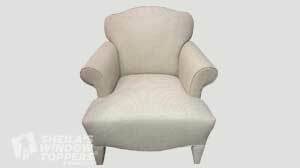 When re-upholstering with us, our staff will guide you through the fashion industry’s latest home design fabrics all perfect for re-upholstery. 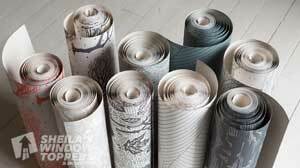 We have a wide range of unique and trending wallpaper. Visit Sheila’s Window Toppers to see our collection of wallpaper and re-create any space, from the bedroom to the bathroom we have an extensive selection of modern wallpaper to suit your needs. Our colour consultants will meet in your home to discuss and get an understanding of your personal decorating plans, style, current trends, favourite colours and ideas to assist with achieving your results. Learn more about our window covering products.